Enjoyed one of the top seasons of any freshman in the country in 2017-18 as she averaged 75.74 strokes in 35 rounds during 12 tournaments…played in all 12 events for the Seminoles during her first year in Tallahassee including the ACC Championship, the NCAA Tallahassee Regional Championship and the NCAA Championship Finals…one of only two players (also Amanda Doherty) who played in all 12 events for the Seminoles in 2017-18…immediately stepped into the Seminoles’ lineup as a true freshman and played in all four events during the fall of her first semester on campus…played in the Ocean Course Invitational, the Schooner Fall Classic, the ANNIKA Intercollegiate and the Stanford Intercollegiate in her first fall as a Seminole…played in eight events during her first spring including all three in the post season for the nationally ranked Seminoles…was at her best in the NCAA Tallahassee Regional Championship in the spring of 2018 as she finished in a tie for 16th place in the individual standings with scores a 72-73-68 for a 3 under par score of 213…set personal records for a single round score (68), for a 36-hole score (145), for a three-round tournament score vs. par (-3) and for a three-round tournament score (213) in helping lead the Seminoles to a second place finish in the regional championship…the Seminoles’ second place finish helped Florida State advance to the NCAA Championship Finals for the school-record third consecutive season…carded a birdie on the first hole of her career in carding a 72 in her first career round in the Ocean Course Invitational during the fall of 2017…qualified for match play at the 2016 USGA Four-Ball Amateur Championship…named to the All-America Scholar Athlete Team by the Women’s Golf Coaches Association…named to the 2018 ACC Academic Honor Roll…named to the 2018 All-ACC Academic Women’s Golf Team…earned Academic President’ List Honors (4.0 grade point average) during the fall of 2017 and Dean’s List Honors in the spring and fall semesters in 2018…averages 75.74 strokes in 35 rounds during 12 events entering her sophomore season. Played as a true freshman in all four of Florida State’s events in the first semester of her collegiate career…one of only three Seminoles who played in all four events during the season…third on the team with seven of 12 scores at 75 or below…counted 10 of her 12 scores (.833 percent) in the team score…carded a birdie on her first career hole in finishing with a season-low tying score of 1-under par 72…was in a tie for 5th place in the individual standings with her first round score…was in a tie for 25th place in the individual standings after two rounds of play…finished in a first semester-best 19th place in the individual standings…totaled a 223 tournament score at the Schooner Fall Classic in helping the Seminoles to fifth place team finish…scores 74-74-75 marked the first time in her career that she carded scores of 75 or better in each round of an event…was tied for 42nd after a first round 74 and tied for 49th after her 36-hole total of 148…played well at the Stanford Intercollegiate with scores of 72-75 in her first two rounds including the first eagle of her Florida State career in the second round of the event…her first career eagle came in the second round on hole No. 9 at the Pebble Hills Golf Club in Pebble Beach, Calif…her eagle helped her finish with a 75 in the second round and in a tie for 23rd place in the individual standings…was in a tie for 12th place in the individual standings after her first round score of 72…also played in the prestigious ANNIKA Intercollegiate and carded a 75 in the second round of the event at the Olympic Hills Golf Club in Eden Prairie, Minn…averaged 76.00 strokes in 12 rounds during four tournaments. The only freshman in Florida State’s lineup who played in all eight events…was single digits over par three times and under par twice as a freshman…played in her first career ACC Championship, her first career NCAA Regional Championship and her first career NCAA Championship Finals events…played the best golf of her first season as a Seminole as she finished in a tie for 16th place in the individual standings at the NCAA Tallahassee Regional Championships at the Don Veller Seminole Golf Course…set personal-bests for a single round score (68 in the third round), for 36-holes (145 in the first and second rounds, score vs. par (minus three) and gross score (213)…carded scores of 72-73-68 to finish ranked third among her Florida State teammates…carded 16 holes at par or better with two birdies scoring a 72 and finishing the first round in a tie for 24th place…played her final 12 holes of the first round at 1 under par with her two birdies coming on her back nine…finished the event in a tie for 16th place in the individual standings as she carded a career-low single round score of 68 in the final round…her first of two tournament scores recorded under par came at the rain-shortened Dickson Intercollegiate (-1) and in the NCAA Tallahassee Regional Championship (-3)…first career top-10 finish and the best finish of her career came at the Dickson (tied for sixth)…second career top 10-finish (tied for seventh) came at the Brickyard Collegiate as each member of the Seminoles’ lineup played as individuals…her under par score at the Dickson came as a 71 in the only round played in the event because of inclement weather…finished as Florida State’s second lowest scorer and in the top 10 for the second time in her career… played her best golf of the final round of the Brickyard over the course of her last 13 holes as she was a cumulative total of 1-under par…totaled one birdie and 11 holes scored at par in the final round…totaled a career-best 145 score in her first two rounds to set a personal best for a 36-hole score…averaged 75.61 strokes in 23 rounds during eight tournaments. Advanced to the semifinals of the 21st Annual Carolinas Women’s Match Play Championship at North Ridge Country Club in Raleigh, N.C. …recorded a 3-1 record in her four match play competitions…advanced to play Jessica Spicer in the semifinals of the Championship Flight before falling 2&1. Played in all four fall tournaments and has played in 16 consecutive events – every match of her career since arriving at Florida State as a freshman…a member of the Seminoles’ lineup in the Cougar Fall Classic, the Schooner Fall Classic, the Stanford Intercollegiate and the Jim West Challenge…helped lead the Seminoles to a second place team finish at the Jim West Challenge and fifth place finishes in both the Cougar Fall Classic and the Stanford Intercollegiate… season-low single-round score of 71 (with four birdies) in the second round for a 36-hole total in 151 of the Schooner Fall Classic…finished the Schooner Fall Classic with a 72 in the third and final round and a season-best 223 total…totaled a 1 over par 143 in the final two rounds of the Schooner Fall Classic (71-72)…totaled a 72 in the first round of the Stanford Intercollegiate and finished with a 225 total for the three-round event…scored a 73 in the second round of the Cougar Fall Classic – an event that was shortened to two rounds because of the imminent arrival of Hurricane Florence in the states of North and South Carolina…first round score of 72 put her in a tie for 20th place in the individual standings after 18 holes of the Stanford Intercollegiate…averaged 75.54 strokes in 11 rounds during four matches. Graduated from Bishop England in 2017…named as the All-Lowcountry Golfer of the Year in both 2015 and 2016 by the Charleston Post and Courier…the state of South Carolina Class AA state championship individual runner-up as a freshman in 2014…also led her team to the state runner-up position as a freshman…won the state high school championships Class AA individual title as a sophomore and finished third in the individual Class AAA state championships as a senior…led Bishop England to two consecutive state championships in 2015 and 2016…earned medalist honors with a 142 total for two rounds in 2015…led Bishop England to a 32-stroke win in the state championship finals in 2015…was also the state championship runner-up in 2014…played as a member of the Bishop England boys team as a sophomore, junior and senior…earned All-Lowcountry honorable mention honors as a member of the boy’s golf team at Bishop England in 2016…girls golf is played as a fall sport and boys as a spring sport in the state of South Carolina…one of the top golfers on the South Carolina Junior Golf Association circuit…earned victories in 2017 at the MTPJGA events at Daniel Island, the Snee Farm Country Club and at the Wild Dunes Country Club…earned medalist honors at the Charles Tighman Carolinas PGA Junior Championship in December of 2016…the runner-up at the Beth Daniel Junior Azalea Championship in 2014 and 2016 and finished in third place in the event in 2015…finished in third place in the 2016 Dustin Johnson World Junior Championship and in the 2016 Sea Pines Junior Heritage Championship…recorded a pair of holes-in-one in 2012 and added a third career ace in 2016…won individual championships at the Twin States Championship, the SCJGA Cheraw Fall Challenge and the SCJGA Players Championship in 2015. 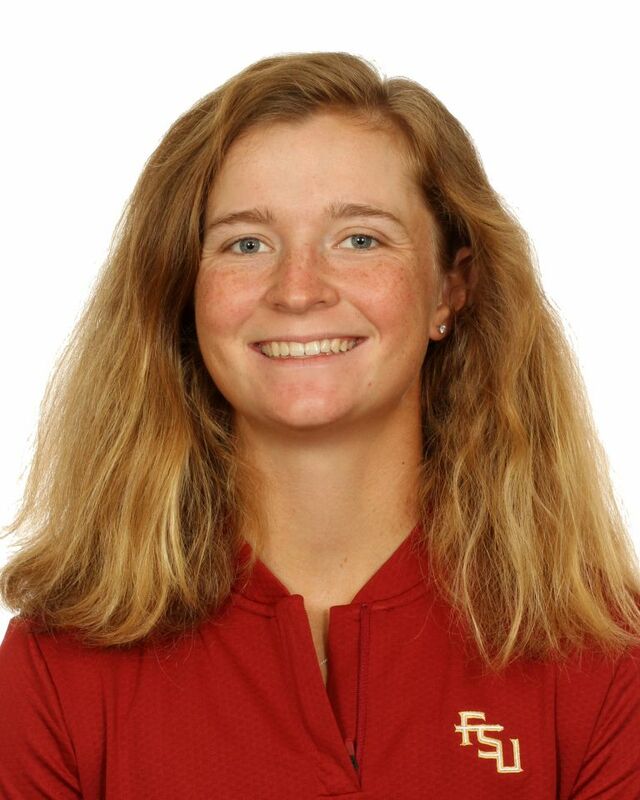 Born May 28, 1999…Kathleen is the daughter of Denise and Steve Sumner…originally from Charlotte, N.C….plays the guitar…a member of the National Honor Society throughout her high school academic career…chose Florida State over Louisville and Furman. My Golf Hero is Lexi Thompson. My favorite golf movie is Caddyshack. My favorite golf course is Pinehurst No. 9. I have three career holes in one. My favorite thing about golf is having the opportunity to travel to many different, challenging courses and meeting new people. I have also excelled in basketball, soccer and tennis while growing up. The best advice you have ever received is the only way you can succeed in anything in life is if you truly believe you can.